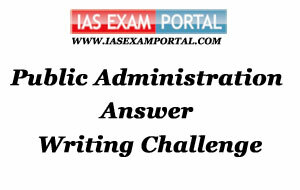 Weekly Mains Exam 2016 Answer Writing Challenge - Public Administration "MODULE- 57" | IAS EXAM PORTAL - India's Largest Community for UPSC Exam Aspirants. Weekly Mains Exam 2016 Answer Writing Challenge - Public Administration "MODULE- 57"
Public Administration- Paper I "Syllabus Topic – Organisations: Public - Private Partnerships "
Q1. With examples discuss the key issue areas in operationalising PPP. Indian Administration- Paper II "Syllabus Topic – Union Government and Administration: Executive"
In a parliamentary democracy like in India, in the last decade no one party is able to gather a majority during the elections and coalition model of government has been adopted. In a situation of a Hung Parliament , the powers vested with the President expand. Under Article 53 and 74 (read together), there must be a Council of Ministers headed by the Prime Minister who must aid and advise the President, however is this group does not hold a majority in the Parliament, then its advise is not binding and it is the discretion of the president that takes precedence. a) Under Article 75 the President must appoint the Prime Minister in the case of a minority government e.g President Zail Singh appointed Rajiv Gandhi as the PM after Indira Gandhi’s death, President Venkataram asked V.P Singh to form a minority government and even Narasimha Rao led a minority government. In the case of a caretaker government, no important policy decision are expected out of the Government and hence the President decides which decision are acceptable. d) Crucial bills are returned for reconsideration to the Parliament. The advice of the CoM , though made binding with the 42nd and 44th Constitutional Amendment Act, however if the Government does not enjoy the majority, its advise shall not be binding on the President. President Kalam returned the Office of Profit Bill. President Pranab Mukherjee asked reconsideration of the Ordinance for amendment to the Representation of the People’s Act in 2013. Growing powers of President may lead to case of presidential dictatorship especially in the context of reducing power of prime minister due to pushes and pulls of coalition allies.The solution lies in setting up a national government as recommended by the Law commission.When a no confidence motion is initiated, it should also suggest an alternative PM to ensure continuity of governance and this way prevent the possibility of presidential dictatorship in a parliamentary form of government.